However, to reach the final goal, this team decided to focus on the improvement of aerostat, and not the rocket. Now “Space cossacks” are building the balloon and call it “Unmanned Hybrid Air Platform”. 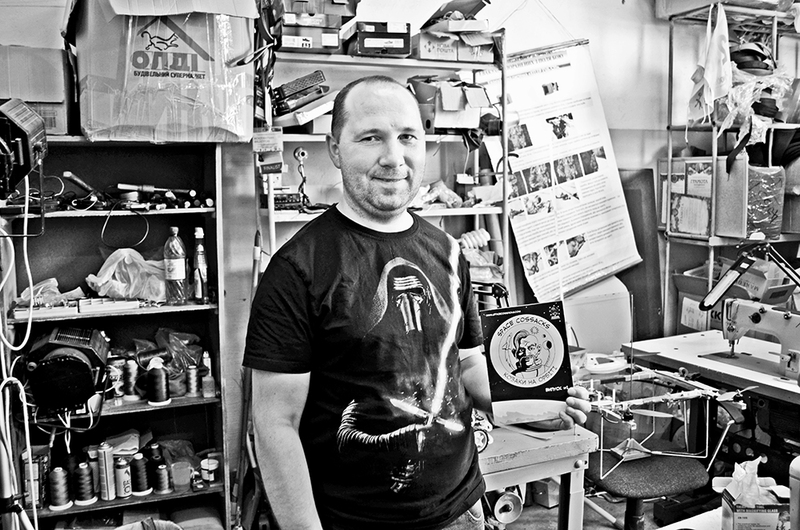 Dmytro Khmara arranged a tour around “Space Cossacks” lab, where the team experiment and improve their balloon. 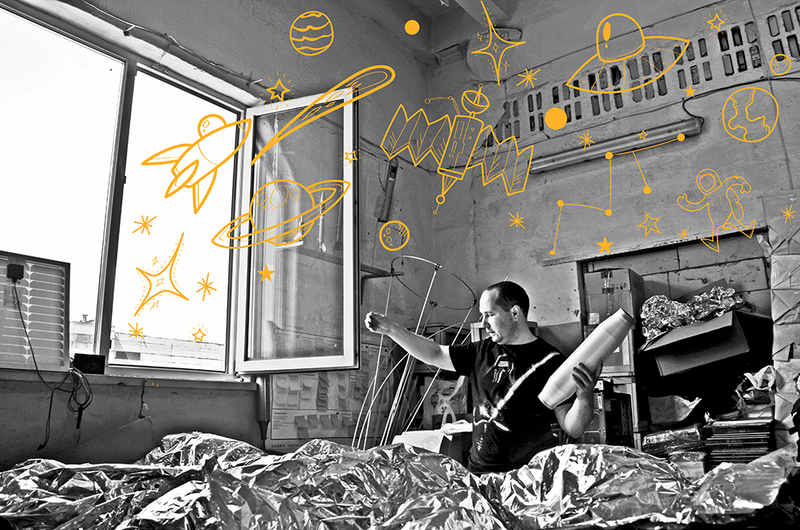 Also Dmytro told “SpaceUkraine” about unexpected victory in ActInSpace hackathon and his exciting travel to France. We started with launching one of our rockets from the simple drone. We put a platform on the copter to avoid burning anything. When the rocket was launched, everything was ok, the drone just staggered a little bit. However, when we launched twice bigger rocket, the drone didn’t feel well. That’s why we decided to improve the drone and make a hole in the middle. It was necessary for the jet stream not to strike the drone, but rather hit the air. Such a drone with a hole proved to be much more stable. Then we decided to attach a bagel-like balloon to this drone, inflate the balloon and make the drone fly not for 5 minutes, but until there’s helium in the balloon. It turned out, that this task is difficult to accomplish, when propellers are inside, and balloon flies outside. There is no single point to apply force and manage positioning, leveling of the system. We came up with the solution to have propellers outside and small engines are enough to control rather big balloon. If balloon gets punctured, then helium will go out gradually, diffusion will take place, pressure will stabilize and the balloon will start gradually go down. If propeller breaks, this event won’t affect the balloon anyhow. Balloon can be brought down any moment. And it’s safe. In many countries it’s prohibited to use drones in populated areas, because the drone can go down and cause harm. Objects like our balloon are lighter than the air, and therefore are more safe. There is one more advantage of using the balloon for video recording against the drone. If you put a balloon in a quiet room without any or little draughts, than the balloon doesn’t generate any noise, while drones roar a lot. Safety and absence of noise are our main advantages over the drones. Our current design with the balloon is much more efficient, than the previous one, that utilized a drone. Our initial assumption was that we could build a balloon around the drone. This assumption failed. Anyhow, launching a rocket from drone is possible. It’s the work, that can be done in the following years. We saw that our ideas are interesting to many people, and we started looking for any sort of a program, that could help us turn our hobby into business. Startups usually can participate in accelerators, startup-hubs, boot-camps. We started networking and met famous mentor Vadym Gorenko, who works in Google. 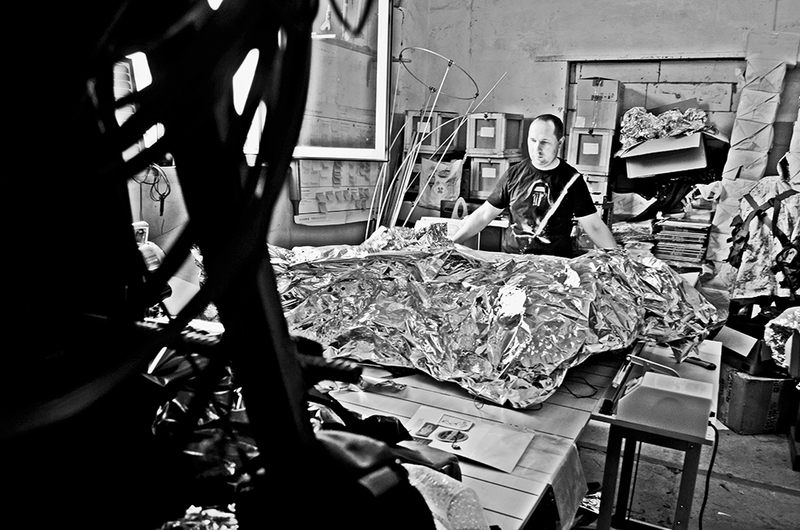 Vadym advised us to try working with Business Factory in Unit City built by Vasyl Khmelnytsky. We applied to this program and were shocked. We were well accepted and the program was totally business-oriented. It’s a mentorship program, which aims at the development of entrepreneurship in Ukraine, and doesn’t demand anything in return. At Business Factory we were immediately told, that the idea with the balloon and the rocket was too complicated. There are few companies in our world, that build rockets, and zero companies, that build such balloons. We were advised to go out and ask potential clients, what exactly they need. Most of people, whom we interviewed, said that the rocket sounded cool, however, the balloon was interesting itself. In a course of last year a market for the drones appeared. Drones are often used in agriculture, in video recording. However, drones have several problems, that the balloon might solve. For example, the drone needs to be re-charged every 20 minutes, while the balloon can fly in the air for much longer, sometimes for as long as 2 months. There are also big drones, that get charged from the socket. These drones have height limit. The higher the drone goes, the heavier cable you need. In order to uplift heavy cable, you need to make it rather thick to transfer higher current. It’s a vicious circle. Besides, those drones don’t go higher than 150 m. We talked to Israel company, and it sells the drone with a car, were it can be transported. And it’s too expensive. One of our potential clients told us a story, when the drone failed to accomplish the mission. There is an old Soviet factory near Kyiv, that was renovated. It was very large: more than 1 km long. There are many such plants around Ukraine, and 150 m height is not enough to cover the whole territory of the plant with infrared or regular cameras on top of drones. If the drone could go as high as 300-500 m and stay there for as long as 8 hours, that would be great. Another client participated in training organized by Ministry of Emergency Situations in the Carpathians. They needed to setup infrastructure for communication. The team planned to put a drone with transmitter, however, 150 m height wasn’t enough to enable connection. We’re talking about the Carpathians mountains here, right! We got almost everything ready before the contest. It was hard for us to find the relevant membrane. Here in the lab we have several types of membranes produced in Ukraine. Membrane that we ordered consists from several layers. This membrane is soldered or glued at the plant specially for us to make sure it keeps helium better, than regular membranes. Right before the contest we received the membrane, that worked best for us. 15 minutes before the contest I built a small balloon. Our victory in ActInSpace contest was a complete surprise for us. I think our well-thought business model helped us to win. We really talked to clients a lot and constantly improved our invention. We had a basic vision of what clients needed and a rough cost estimate. Last year we participated in Vernadsky Challenge and also Space Valley hackathon in Dnipro, where we also made it to the final round. For both of those 2 contest we applied with a rocket. We even took the rocket to ActInSpace event. However, after Business Factory and following mentors’ advice at hackathon, we made the first pivot. We were also told, that we could apply to DGA05 contest with our balloon in category “ Increase the autonomy of drones using balloons”. This competition is held by DGA (Directorate General of Armaments) – organisation, that deals with security issues in France and EU. 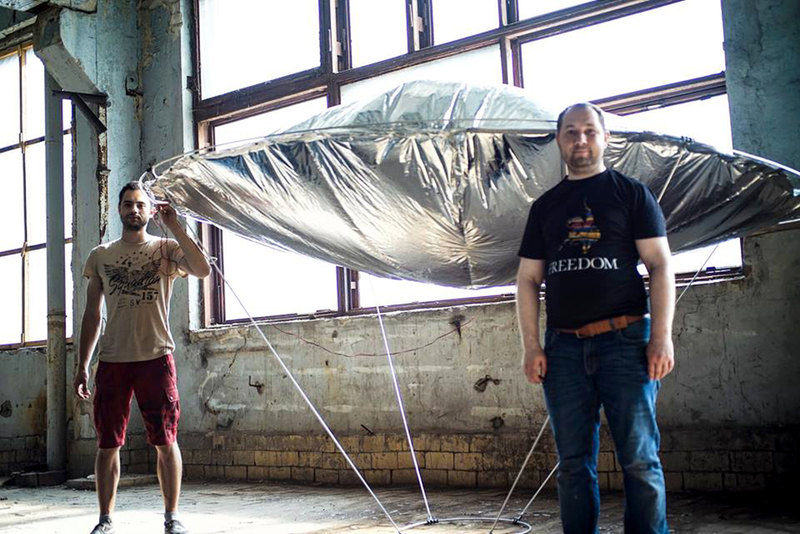 So we applied to DGA contest with our balloon and built a big 3×2 m prototype in a month. What is the main idea of our startup? We want to make sure, that the zeppelin (the balloon) can be operated easily. Like a simple copter. For little model on remote control we have only 4 buttons: left\right and up\down. If you press two buttons simultaneously, it can also go circling around. Balloon will be filled with helium, which provides Archimedes force, because helium is lighter than the air. Our balloon goes up without spending much energy to fight gravity. When we need to go down, we simply squeeze the structure inside the balloon. Both pressure and density go up, the balloon becomes heavier and uplifting force decreases. We want this process to be rapid and efficient, and we are working to improve the speed of balloon’s feedback. Until recently we’ve thought, that the speed of reaction could be increased by using additional guiding slats, that would squeeze the membrane. However, it turned out that modern materials are rather cool, and we can just squeeze the membrane like you can squeeze the ball. Now we use patterns to cut out necessary membranes and solder them on a special equipment. We do it ourselves, because no one else in Ukraine can do that. Now we have three special welding-machines, however, we started with a simple soldering-iron, that we modified by adding bearing and teflon tape. This tape we are also using now on our welding-machines to avoid clinging. It’s difficult to do soldering manually, because you get a lot of junctures, so now we’re looking for the way to automate this process. 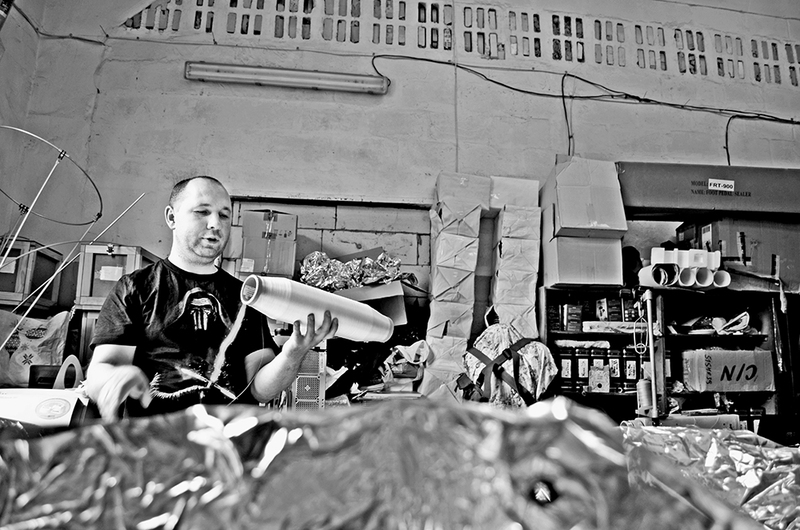 Alexander in our team builds all the patterns for the balloon and solders them. Also he experiments with all sorts of glue. You can’t solder everything, sometimes you need to use the glue. We tried using all the Ukrainian glues, and the best one for elastic membranes is ASKO UKREM manufactured in Kharkiv. That is the only glue out of 30 different glues, that fits our needs. This glue keeps the pressure well under low temperatures, and also endures multiple bending. Every joint has holes with eyelets. We put strings there, and also there’s an engine inside the balloon. We want to patent the way how we connected everything inside this structure. This whole mechanism squeezes the balloon gradually, pressure increases and the balloon goes down. 3,2 m membrane is 6 cubic meters in volume. Its own weight is 3 kg, and it can carry up 3 kgs of weight. We experimented a lot with this internal mechanism, consulted our mentors. Finally we came up with an awesome solution, which is light and elegant. We couldn’t take our big structure and the balloon to Toulouse. So we decided to build a smaller prototype, that uplifts 1 kg. The smaller construct is just 1 cubic meter in volume and 1,9 m in diameter. It all packed into a long small box, which weighs 350 grams. We were even able to put there 60 g camera and better batteries. We were afraid if the balloon goes up at all. And it turned out, that the balloon not only goes up, but is also able to carry up to 0,5 kg of weight. Instead of aluminium, we used carbon, that weighs 8g per 1 meter. Previously we had a problem with aluminium, that had 63g of weight per 1 meter. With a better membrane quality we were able to get rid of guiding slats. So instead of 6 carbon slats on perimeter, we build the circle and put membrane on it. Then we blow the membrane and attach to it three small blocks with electronics and a camera. We came up with a very efficient construct. Unfortunately, we couldn’t show it in Toulouse. However, in Toulouse we found where to buy helium. In Toulouse helium cylinder costs 56 Euro (including delivery), while the same cylinder in Ukraine we bought for 110 Euro. We were surprised. We use carbon produced in China. Manufacturing carbon in Ukraine costs 4 times more, than buying it in China. Electronics we also buy in China. All the carrying structures and components are printed on 3D-printer. Helium is also bought overseas. And membrane is manufactured in Kyiv. Unfortunately, this membrane is not of the best quality, so we’ll try ordering membrane in Germany to see how it’ll work. There are plants, where membrane is manufactured in large volumes. However, a considerable amount of money is needed to buy small portions. Previously we bought batches up to 1 kg. The batch we have now will be sufficient for 12 balloons. That hank weighs only 15 kg, and big plants in Kharkiv or Mykolaiv produce hanks starting from 200 kg. We came to ActInSpace hackathon with a 3 m large balloon. On the first day of hackathon we showed our presentations, that Svitlana Khutka helped us to develop. Svitlana showed us presentations of the early days of Uber, AirBnB. When we presented our project in the final round in Kyiv, we still made many mistakes. However, in Toulouse semi-finals we presented much better. Tetyana Tymchenko was the main speaker on the stage, she helps us with marketing research. Me and Alexander answered technical questions. We even used only half of the allocated time for presentation, and the referee asked us to tell more interesting things.Vadym Gorenko helped us with our business-model. We printed it and put on a wall in our lab. We are still experimenting, and working constantly to improve it. We’re looking to new partners, trying to unerstand what to sell them, where and what to buy.We were also afraid that Ukrainian standards do not correspond to the world level. However, when we saw presentations of other teams in Toulouse, we understood that Ukrainian mentors got us prepared on the world level, and we’re very grateful to them. ActInSpace hackathon was organized very well. There were a lot of mentors, who helped us with technical, marketing, sales issues. Mentors arrived even during the night time. Hackathon venue was very comfortable, and people stayed at National Aviation University (NAU HUB) for a long time. Final round took place in NAU angar.The second place at hackathon was taken by FutureMechanics, very strong team. We’ve known founders of that team for a long time, they consulted us before Vernadsky Challenge. They advised us both on marketing and technical topics. Previously we used to discuss with them mainly the rocket, while now we focused more on the balloon. We thought, that FutureMechanics would win, because they had interesting and strong project. FutureMechanics wants to enable cars to exchange information in order to avoid road accidents. It’s a hot topic nowadays, and we saw similar projects from other countries in Toulouse.FutureMechanics has very powerful marketing and technical components. It’s a miracle, that we won. Anyhow, they didn’t get offended, and ready to cooperate. Also there was a cool project aimed at growing insects to eat them in space. I believe, that many companies work on space projects, because there are resources in space, that can’t be found on Earth. Growing food in space is a perspective project, that didn’t win, unfortunately. Also I liked Dmytro Kostrenko’s project. He has built a space planner – rocket plane. Dmytro wants to make it bigger. 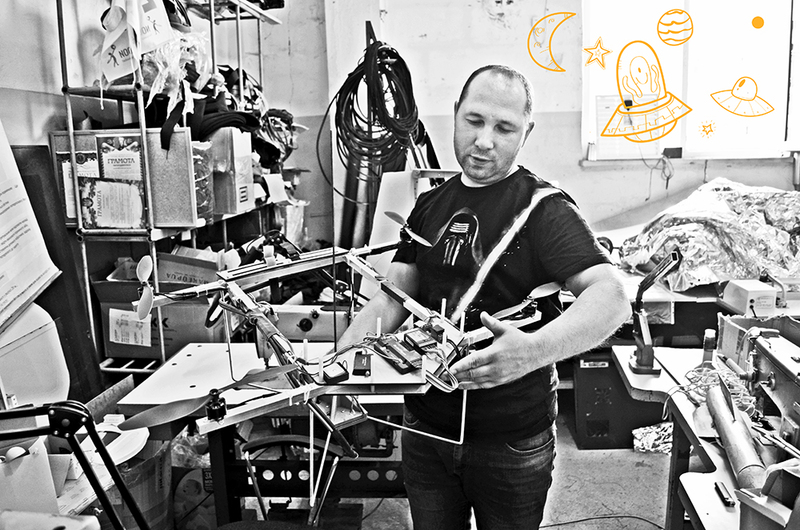 In order to test his invention, Dmytro wants to hire helicopter, because rocket plane is rather heavy, it has engines onboard. We agreed with Dmytro, that he will use our balloon. Space suttles had a similar problem. They couldn’t fly well enough, couldn’t land easily. Nowadays even Elon Musk discusses the idea of such a space airplane. Elon has an idea of transfering people to any place on the Earth within 30 minutes, through space. Richard Branson is also talking about the similar idea, he wants to start entertaining tourists. However, Branson is aimed at setting up flights from the USA to Europe in 40 minutes through stratosphere. These multi-usage space airplanes is a very perspective idea, and many people are waiting for it to become real. Imagine flying to the USA not for 12 hours, but for 30 minutes. How many issues could be solved! Many countries are now building cosmodromes able to accept such space ships. I know, that there are people in Dnipro, who think of the similar things. In Dnipro they plan to renovate their airport, and some active communities suggest, that the future airport should be able to accept space ships from Musk, Branson or a company in Switzerland, that is also now working on similar projects. Companies in the UK and Switzerland are already building such space ports. In the USA they have already built “America” space port. Here’s what I can say about Ukraine. Either Ukraine becomes a hub, able to accept space ships, and then people will go from Ukraine all over Europe, or everyone will fly to Poland. So we have a window of opportunity. Dmytro’s rocket plane can help here a lot. Previously he planned, that rocket plane will go to space and launch sattelites on different orbits. However, the bigger perspective lies in the field of using rocket plane to transfer passengers. A lot of interesting people took part in ActInSpace hackathon. For example, Radiy Redutny presented 2 projects. He invented his own type of fuel, that is good for Moon exploration. I wish these projects had any sort of help, some accelerators or startup-hubs. We were invited to Europe, the Baltic states, where there are accelerators tailored to space exploration. They give initial financial support and teach you how to talk to investors, how to build sales. Ukraine lacks such accelerators it a lot. There are many initiatives targeted on IT, agro, financial sector, and very few things for space. Except for Noosphere Ventures, i think, nobody else works on space issues in Ukraine seriously. We’re very grateful to Oleksandr Butkaliuk, who shared his experience after his victory in NASA Space Apps Challenge with his Mars Hopper project. He advised us how to simplify the structure of our balloon. He inspired us a pushed a lot. I’m not sure if we could complete our prototype without his help. Also Natalia Borotkanych helped us a lot. First of all, Natalia with a help of Kseniya Semenova-Shelevytska organized ActInSpace event in Ukraine. After the victory she took us everywhere, and did a lot of job in terms of promoting our video during the voting process. These videos were closed, they were a part of a special playlist. Only those people, who followed the link, watched this video and got interested, were able to vote. Приз глядацьких симпатій was conquered by the German team, and we lacked 200 votes. We had 1500, while German guys received 1700 votes. 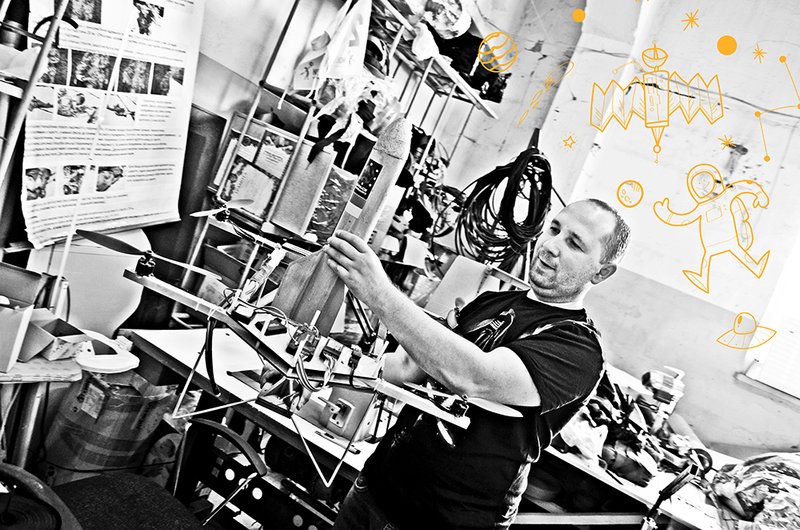 Until recently ActInSpace hackathon took place only in France, then startups from all over Europe were invited. This year ActInSpace became international and opened its doors for the teams from all over the world. This contest is held once every two year by European Space Agency and French National Center on Space Research. I think it’s the fourth time ActInSpace is held. On the first day in Toulouse we saw the final round of ActInSpace France. We watched how French teams presented, learned a little bit, improved our presentation. 20 teams from France were competing for the 1-st place. On the second day Space Cossacks and 28 other teams participated in international semi-final contest. We were divided into groups and went to business-school venue. Организаторы didn’t envision that many teams, so there was little space in the venue. Also it was forbidden to bring anything due to security reason. Unfortunately, we weren’t able to inflate our balloon in semi-final, however we set it up and showed how it worked. A bunch of very young guys won in our cohort. They had a cool idea: using NASA patens for all sorts of filters. For example, to purify water from Mercurium, because seas and oceans are very polluted with it. It’s a good global idea, those are smart young people, and we were sure from the very beginning, that they would win. Anyhow, if we were able to inflate our balloon, I think we would have a chance to compete in our group. Our group consisted from 6 teams. I believe, other groups had 5 teams. During semi-final day, teams in the groups presented since the morning, giving answers to all sorts of questions. We weren’t announced the results, and went from the business-school to the Exhibition center. In the beginning there was an official ceremony. Interesting child projects were presented, various sponsors told about their plans and ideas. Then 1 team from every group was called on stage, and that’s how we realized it was actually the final and we didn’t make it. Winners from all the groups presented their invention on the big stage. In fact, presentation that you sent 2 days prior the competition, you then presented in the semi-final, and then if you made it through, in the final stage. We realized, that it’s very important to have a well-elaborated presentation beforehand. Australian team, that won this competition, wants to build a global system of drones control. All the drones must have unique ID’s, so that they could be traced easily. Everyone should follow the agreed rules. Good idea, I believe. They started presentation with showing a piece of “Futurama” cartoon, where drones carry staff and everything flies like a crazy. They want to come up with common rules to regulate this mess, to be able to observe all the drones from satellites. In modern world we have a similar system to follow all the airplane flights, called Flightradar24. Australians want to develop a similar system for drones. In our group we also had some cool projects, that we expected could win. For example, a team from Germany built a system that lets to do 3D scanning of the environment at the point of a road accident. It also lets to do 3-D scanning of the car or a satellite at the plant. If accident happens, you have 3-D video recording of what had happened. They have a helmet and a special joystick, and you can watch any time, which parts were flying, with what force and at which direction. Sound like a fantastic movie! We thought that team might win. Also there was very cool team from Spain, they developed a technology to position yourself according to the stars movement. If you go deep into the колодец, you can see black sky and the stars. The sun doesn’t слепить us. Usually the problem is that we see рассеянный свет. However, to observe the sky, you don’t need to go into the well. You might use a membrane. In the modern world we have special polarizing glasses. Vikings traveled through the sea even during cloudy weather. They could see the sun, and special stones. Anyhow, modern civilization is much more technically savvy. Before GPS era, all the stuff, that flew to the space, coordinated by the stars. It’s not the new idea, however, the team from Spain invented a small device, that lets you look to the sky even during the day time and see some stars. If we know the map of the starry sky, we can immediately calculate our position, without any GPS or Wi-Fi connection. I guess this team could win with this idea as well. Polish team included military people. NATO base provided military истребитель for their video reel. Very good team. They worried a lot that they lost, and to the final round they really put on their military uniform. However, even before the final round they were walking in formation. We learned our lessons after the final round of ActInSpace, and we want to share some advise with the teams, that will follow. The first thing is that your project must solve global issues. The problem should be really important for the humankind, and you really need to show, how to solve it. Such projects have higher chances to win. The second thing, which is important is wow-effect. You project must impress. If we were able to show our prototype, that would have helped a lot. The final mark consisted from 20 points. We don’t know, how many points we receieved, and couldn’t find this information. Perhaps, it will be announced later. This 20 points are structured in the following way: 8 points – business potential, 4 points – innovation, 4 points – social importance, 4 points – personal opinion of the judges. Knowing these inputs, you can tailor your presentation accordingly. So if you have a global project, that is well elaborated and impresses judges – it’s a good foundation for the victory. Also, many countries, that held ActInSpace contest, separated hackathon from the final stage of presentations. They decided to have a hackathon day, when teams were working hard on their projects for 24 hours, and then a separate day, when teams after the good rest presented in the final round on stage. It was the case with national hackathons in France, Germany. That’s why we would like, that the next year during NASA Space Apps challenge and ActInSpace hackathon in Ukraine the final rounds took place in separate days. This year the contest took place for the first time in Ukraine. Organizers, I believe were afraid that there would be little interest towards the competition, that’s why they selected only 50 participants, however, there were much more applications. I think, the next year more people will participate in ActInSpace hackathon. Those participants who added pictures, video, interactive pieces to they presentations had more chances to win. Some presentations went beoynd 6 dedicated minutes, however, they were so cool, that the judges didn’t stop presenters. In Toulouse we met interesting people, exchanged ideas and opinions. For example, we agreed with Spanish team, that we will use their sensors to position our balloon. A team from Argentina wants to buy the balloon prototype to use in their agricultural sector. There was also a team from Guatemala, where Victoria from Ukraine participated. She came to Toulouse and then traveled back home to Lviv. They team of architects and designers wanted to use all sorts of satellites to predict bad weather of solve incidents. They could also use our balloon to conduct observations. An important part of the event was Startup Alley. It had nothing to do with ActInSpace contest, which was held within the scope of Toulouse Space Show. 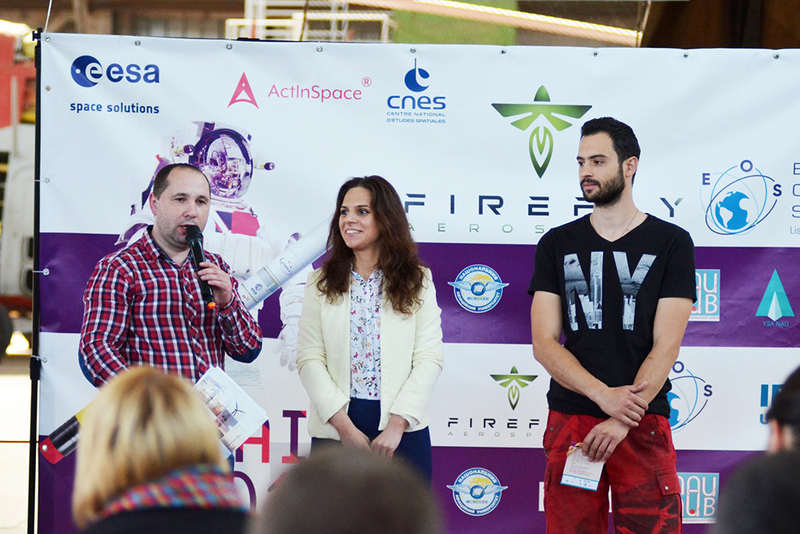 We got acquainted with the founders of some space startups, that took part in Startup Alley. One of the ideas, that we’d like to explore in more depth is geodesic rocket. This rocket can go 50-150 km heigh and allows to test the equipment. In Ukraine we have a lot of people engaged in rocket modelling, and they could also try working with this new type of rocket. You can put in such a rocket equipment, that needs to be tested on a big height or under acceleration conditions. And you don’t even need to launch a separate satellite. Those who love electronics, there is an exciting Arduino tool-set. We met the team, that develops Arduino for space exploration. You can buy a cheap Arduino, set it up, test and then buy the same boards and software from that team and launch it to space on the new hardware. Such an approach decreases the cost of development and doesn’t require any special equipment. I didn’t know, that such things exist.There is a faculty of Energy saving and heat technologies in National Technical Institute. They have already launched 2 satellites, and get prepared the third one with a video camera. We discussed that camera with their team, and it costs $15,000. Also you’d need to buy special lences, because the camera must be able to work in space. If we build a satellite, that should be able to work in atmosphere, we would also need a special camera. In Toulouse we found a lot of ready-made cameras, specially adapted for space, and not that expensive. The world is changing, and there are many cool inventions, that you could use. 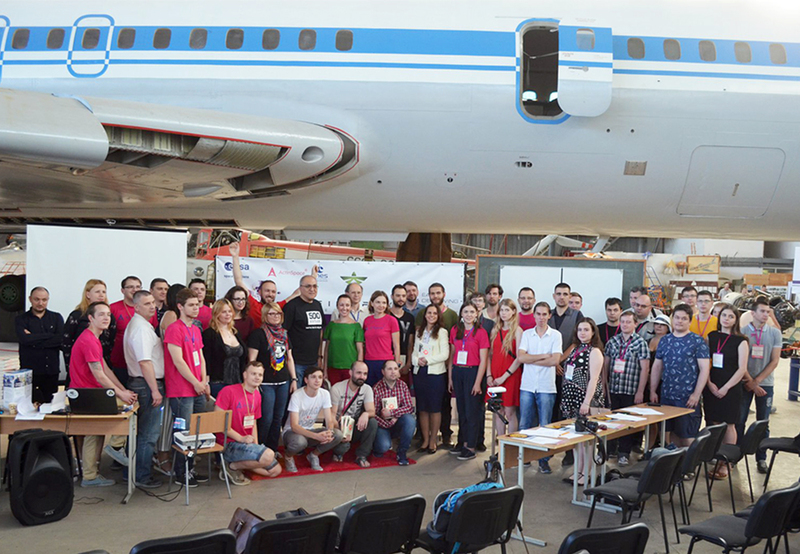 That’s why we’re grateful to Ukrainian организаторы of ActInSpace hackathon, and this chance to get to Toulouse. For us it was useful not only to take part in the contest, but also to talk to people, who work in the space industry. We were also invited to Space Industry Day. It was important for us to see, how people do the networking, how they turn they space hobbies into business. I don’t know, where else you could get such a great experience. In Ukraine people think, that space is a very complicated, fantastic thing. In places, where we have been space projects are much more real. In Europe everyone knows, that Ukraine is a space state. 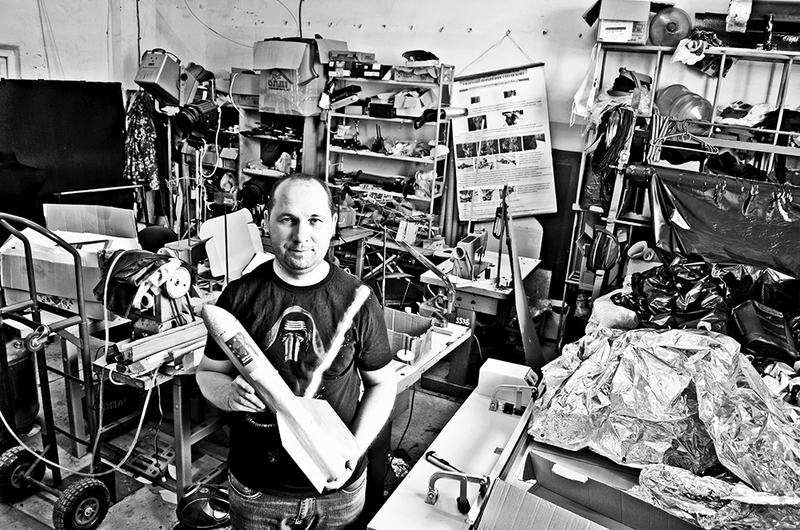 However, noone understands, why there are so few Ukrainian space startups. In Poland they have many space initiatives and plans. For example, in Poland there is a special station, where they imitate Mars conditions. Soon they will organize contest of Mars and Moon rovers. In Poland they work hard, they have several accelerators, aimed at space projects, and many consulting companies. In Ukraine we have rockets, but it’s hard to make real business in the space field. Anyhow, I believe that the situation will change. A lot of people want changes to take place. According to the law only state enterprises now can conduct space research. Many people think that’s a hurdle. I think, that support of space research by private companies in Ukraine is very important. 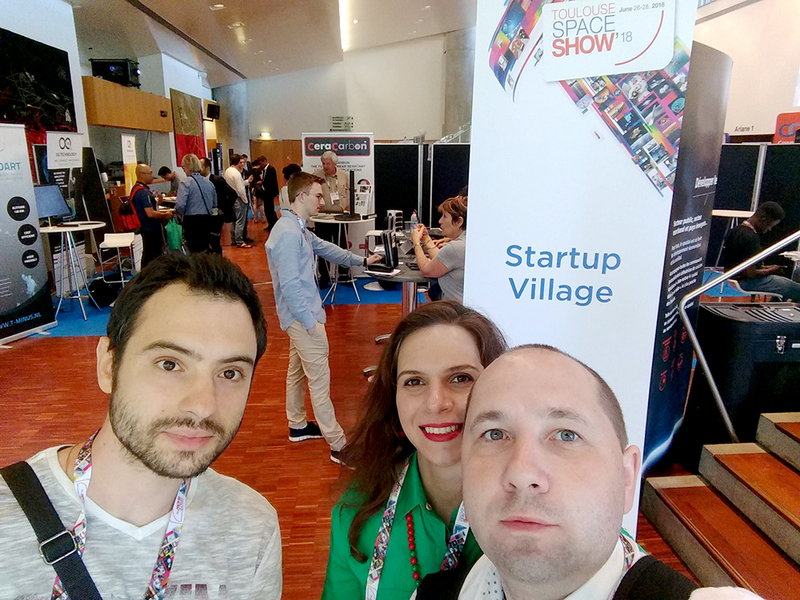 During Toulouse Space Show we met Volodymyr from Kyiv, he’s a co-founder of the startup, that builds components for satellite batteries. They have already launched their sales and attracted first customers. Volodymyr is responsible for marketing in this company, and he gave us a lot of useful advices how to talk to European customers. There is a Polish consulting company Kapitech, which was a sponsor of Ukrainian ActInSpace hackathon. There are people from Ukraine among employees of Kapitech. They helped to organize ActInSpace event in Ukraine, and also introduced us to other teams in Toulouse. We saw many Ukrainians at the exhibition, unfortunately, we couldn’t get acquainted with everyone. I don’t know if anybody from Ukrainian state enterprises participated in the event. When we came back from France, we already had two closed picthes for private investors. We have customers, who want to test prototype of our balloon for video recording, observations, uplifting stuff and entertainment. Our priority for the following 1-2 months is to build 12 prototypes. Two requests we received from our mentors, who helped us during the program. They’re very excited to test our balloon. People are waiting for our product, that’s why we want to focus our efforts on building these prototypes and handling them to the customers. 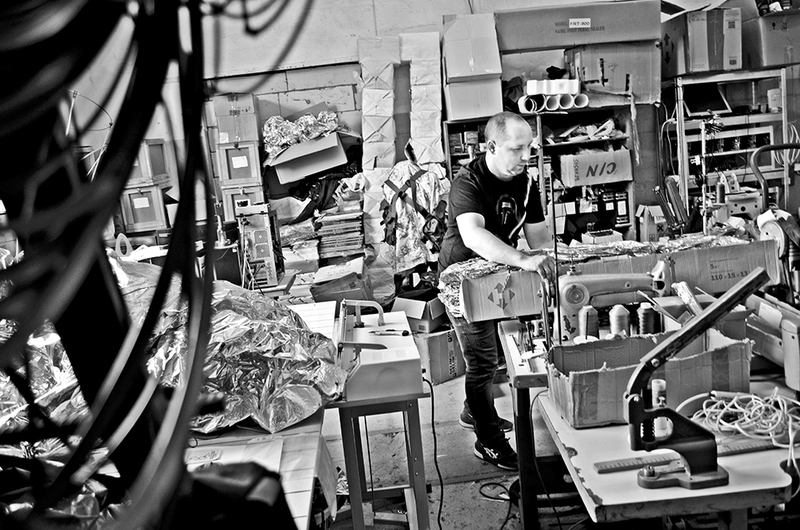 We’ll do our best to manufacture everything in-house. A lot of details we have printed on 3-D printer. Sometimes, we need up to 5 attempts to manufacture the right detail. However, now we know, how to get things done, where to buy and store stuff. Our current prototype can be put in a small prolonged box.We have a remote control with 3 channels, and we plan to make 4 channels. Also we have a block with batteries and a block with small camera, which is enough to do observations. Besides camera, you can put there transmitters, if you need to setup a more stable connection or improve the quality of connection with another drone.We’re constantly improving our balloon. We want to make it able to transfer small parcels. Perhaps, soon we’ll announce cooperation with a startup, that produces cool stuff, and we will deliver it on top of our balloon. Besides the camera, we have 0,5 kg of useful weight. We’re now thinking, which other useful things our balloon could carry. It could be a hook or a mechanical arm. Also we could put multiple cameras to come up with 3D picture or 360° recording. We want to measure pressure inside and outside the balloon, direction and power of the wind. While our balloons will fly over Kyiv, we will make the map of the winds and various heights. Normally at big heights you’ll see more or less stable winds, that are distributed between layers of atmosphere. We can track the behaviour of those winds. Knowing the map of the winds will allow us to move our balloon just changing the height, and save energy in such a way. Anyhow, to accomplish this task we need to launch several balloons and start collecting data. It’s a big chunk of work, and we are looking for the partner to process this data. I believe, such a winds map will be useful both for aviation and amateurs. Perhaps, it will elso allow to conduct researches necessary for ecology.We want to enable our balloon not just fly, but be smart and with multiple features. We want to be able to setup autopilot mode, so that the balloon could go to the designated point, take the вантаж or just go somewhere and conduct obervations. We have everything to accomplish these tasks, because previously we used the same approach to control the drone for launching rockets. It’s an open source software, standard flight controllers used to manage copters. This software is already in use, we just need to tailor it to our needs.During ActInSpace hackathon we received a very important notification from DGA – they said they’re interested in our prototype. We sent them additional information and are waiting for the feedback. Also we were invited to take part in Industry Space Day, that will take place in Amsterdam in September. We want to take better prototypes there, conduct demos and establish contacts in Europe. As the next step, we want to assemble a similar structure, that will be able to carry dozens of kilos of weight. Then we could try using a bigger drone as atmosphere satellite. For many tasks there is no need to launch a satellite into space. Such a satellite can be placed over the line, where airplanes fly (20-30 km higher). The weather is steady there, there are no clouds, and nothing will interfere with a satellite. Such satellites or “high-level platforms” are considered to be the frontier technologies in Europe. Everyone is talking about these sorts of technologies at large conferences with hundreds of participants, and we want to enter this market. We want to build a real aerostat, that can be controlled, that can take a load and deliver it. Also, talking about our dreams. We’ve made some pre-calculations. We plan to build a rocket, that will weigh 2 tons. So we need to lift at least 3 tons (the balloon + and a rocket 2 tons weight) at the altitude of 20 km. Now our balloon is 3 m in diameter, and it can go up to 5 km. Later it will be 18 m in diameter, really big, like 2 buses. Perhaps, we’ll need another technology to make the balloon go up to 20 km. So another important step is the ability to go to stratosphere. Once we are able to uplift several tons to stratosphere, we’ll be able to make space-launches from there. Such an approach has many advantages. You don’t need a spaceport. You can take the balloon, go to any country and launch a rocket from there, or above the ocean or any uninhabited place. We love this idea a lot, however, we realize there’s a hard and a long way to go. Many people tell us, that the rocket-launch market is crowded. There are even 2 companies with a roots from Ukraine: Firefly Aerospace (based in the USA) and Skyrora (based in the UK). They manufacture small rockets. And we know another 20 companies in Europe, that produce rockets. They have launch facilities and simplified regulation to make such launched possible. Most probably, we won’t need to build our own rocket, it’s be possible to join efforts with some other team.